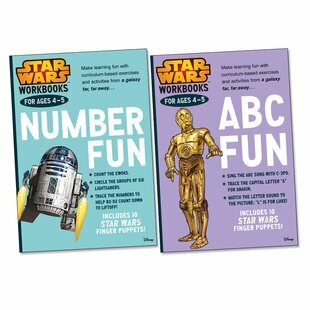 Learn with the Force – and some nifty finger puppets. Since sliced bread the best thing it is, says Yoda. (He’s wise and he knows.) Fancy yourself as a Jedi? We’ve got news for you. Surviving in the Star Wars galaxy isn’t just about waving a lightsaber. You won’t get far if you can’t count enemy starships or spell your Jedi Master’s name. No worries: these books will make sure the learning Force is strong in you. Loads of handy activities to build first counting and ABC skills. Plus colour pictures of your favourite Star Wars characters and objects. Each book even has ten cut-out finger puppets to play with. Perfect for little stars.